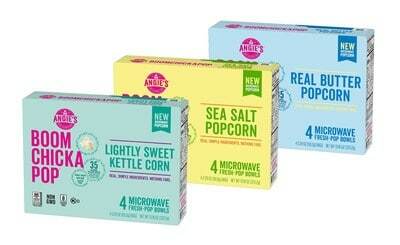 Conagra Brands Inc. has introduced Angie’s BOOMCHICKAPOP Microwave Popcorn. Angie’s BOOMCHICKAPOP Microwave Popcorn is available in three of the brand’s most popular ready-to-eat flavors – Real Butter, Sea Salt, and Lightly Sweet Kettle Corn – all made with whole grain popcorn, sustainably sourced palm oil, and non-GMO and gluten-free ingredients. Angie’s BOOMCHICKAPOP Microwave Popcorn stands out not only because of the flavors and colorful packaging, but also through the ingredients that go into each bag. The Real Butter variety is flavored only with real butter and sea salt, and the Lightly Sweet Kettle Corn variety is sweetened with real cane sugar and monk fruit extract. All three popcorn varieties contain 35 calories per cup, popped. Consumers will also appreciate the innovative packaging, as Angie’s BOOMCHICKAPOP Microwave Popcorn comes in a “Fresh Pop Bowl” designed for easy popping and less cleanup. Angie’s BOOMCHICKAPOP ready-to-eat flavors range from classic varieties such as Sea Salt Popcorn and Sweet & Salty Kettle Corn, to more unique flavors like Chile Lime Flavored Popcorn and Cinnamon Roll Drizzled Flavored Kettle Corn.